I’ve always known Michigan to be The Wolverine State, so how did I miss another of its nicknames – Water (Winter) Wonderland? 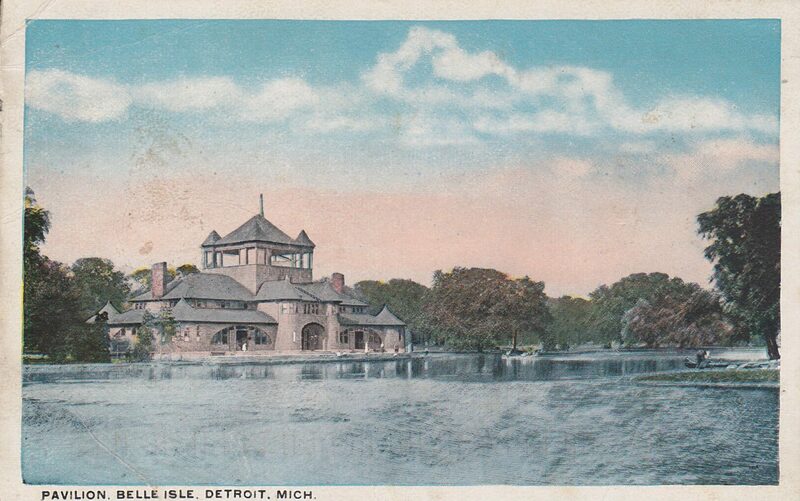 Anyway, it is where The Bookstore Podcast is recorded by Becca Younk and Corinne Keener who found this vintage postcard – 5 ½ x 3 ½ inches – featuring the Pavilion at Belle Isle as it was then. What a treasure for my collection! Be sure to slide to the reverse side and read what they’ve written. 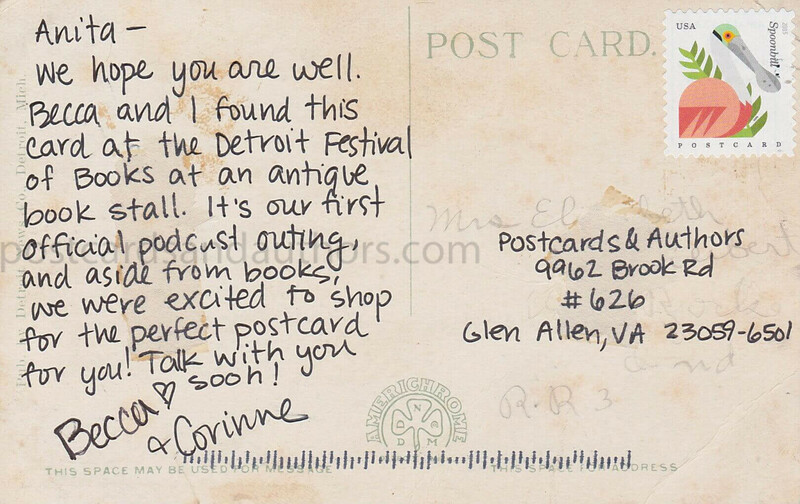 Thank you Corinne and Becca! Schedule: There is a new episode every Tuesday. Every other week, there is a book discussion and review of one book title, and the following week, an episode on book news and other book related topics. Book Selection Process: Both of us keep personal lists and enter some titles on our Goodreads accounts to consider. We also get recommendations from friends and our social media followers. Sometimes a publisher will send us something. Googling “recently published short novels” can be a source, too. We try to keep it varied to avoid reading similar topics for several episodes in a row. As for criteria, preference is given to books written by non old straight white dudes, and we usually keep our books under 300 pages in order to have time to read and record. Genres Discussed: We both prefer literary fiction, but we put in a lot of effort to read broadly. It was a real push out of our comfort zones to give Romance a try. Most Challenging Book Discussion: Corinne – Any book that I did not personally enjoy. It can be hard to reasonably critique without getting too snarky when I really dislike something. Becca – Graphic novels, due to the unique challenges of discussing a visual medium in an audio-only medium. Recording Locations: We live on opposite sides of Michigan. Our discussion is over a phone call and then we record it independently on both ends and edit the files together. Corinne records both her mic feed and Becca’s phone call (as a backup in case anything goes wrong on Becca’s end) through a soundboard in her family room in Grand Rapids. It’s the only room in the house with carpet, so it keeps the echo down. Becca records with a Zoom H1 Handy Recorder at her vanity in front of a window in her spare bedroom in Bay City and then sends the audio file to Corinne to be edited together. We don’t see each other when we record, so it took some time getting used to not talking over each other all of the time, even though Corinne is still very bad about it. Generation you label yourself as: Becca is 31 and Corinne is 29, which we guess makes us Millennials. Their Millennial Apology: Sorry for killing Applebee’s and napkins and plastics straws! <-- Read the related article from them. More about Becca and Corinne: Read their ABOUT page!